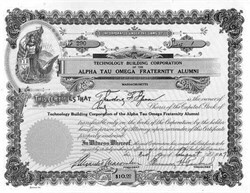 Beautifully engraved certificate from the Technology Building Corporation of the Alpha Tau Omega Fraternity Alumni issued in 1927. 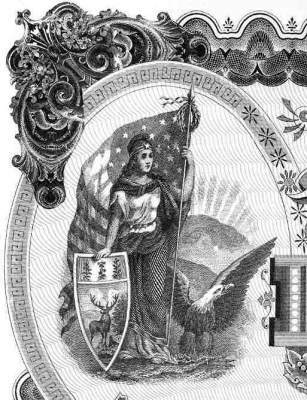 This historic document has an ornate border around it with a vignette of an allegorical woman with an eagle. This item is hand signed by the Company’s President and Treasurer and is over 75 years old. A Brief Summary of the MIT Fraternity System Despite the fact that fraternities have played an important role in housing MIT students for 100 years, I was unable to find historical data gathered from this point of view, although there appears to be considerable information available from various sources — particularly Technology Review (starting in 1899) and the Technique (starting in 1886). I might add that in recent years the format of both of these publications has changed and that neither have much written information on alumni activities or, for that matter, student activities. It was not until 1886 that Sigma Chi actually had physical facilities which they obtained by renting a suite of rooms, a pattern that most early fraternities followed. "Boston Tech" never had dormitories! The first dormitories were made available when the Institute moved to Cambridge in 1916. However, in 1902, private investors built a large housing facility, apparently aimed at the Tech student market, near Boston Tech on Boylston Street located approximately at the eastern end of the Prudential Center complex. It was called Technology Chambers and had 176 rooms, many of which were occupied by MIT students. In the limited time available I’ve gathered the following background which may be of interest to you. The first fraternity, Sigma Chi, was founded in March 1882. Within three years Theta Xi and Alpha Tau Omega were chartered (1885). The club known as The No. 6 Club from its house at 6 Louisburg Square soon became a chapter of Delta Psi and within the next six years Technology had chapters in Phi Gamma Delta, Delta Tau Delta, Delta Kappa Epsilon, Chi Phi, Delta Upsilon, and a local, Phi Beta Epsilon, which has maintained its independent status for over sixty years. The fraternities, although few, were extremely useful in providing living quarters for congenial groups of men in limited numbers, but in the eighties and nineties they comprised only a very small part of the student body. By 1886, the first year that the Technique was produced, there were still only 3 fraternities with 39 actives, out of a total student body of 302. However, by 1900 the number had grown to eight fraternities and the number of activities had increased to 234, not quite 20% of the student body. Within the next 15 years the fraternity system had more than doubled to 20 fraternities with 481 actives, about one-third of the 1915-student body of 1,685. Although I’m not certain of the underlying cause, there was some national anti-fraternity sentiment at this time in the United States, similar to that of the late 60’s. Then, as more recently, MIT’s system apparently remained strong. The Institute had dormitories for the first time in 1917, after MIT moved to its location across the Charles in Cambridge. A description of undergraduate houses in the 1935 Technique points out that they were first used as fraternity houses. By 1935 the undergraduate student body had grown from about 1,600 at the time of the move to about 2,000 — the graduate body which was very small, about 80 students, had grown to slightly over 200 — primarily students working for their masters degrees. As the student body grew the fraternity system continued to meet the needs of about 30% of the undergraduates. Run as private enterprises and managed by active brothers with assistance from alumni house corporations, they had none of the tax advantages of a nonprofit institution and yet they provided a very efficient, cost-effective option to dormitory living. The Interfraternity Council (IFC) first began to appear in Technique in 1915, but my guess is that like many MIT organizations it had probably existed informally from 1885 when there were only three fraternities. From the beginning, fraternities engaged alumni as trustees and advisors and each house had its alumni corporation or board of trustees. Shortly after World War II, various members of the administration — Frederick G. Fassett (Hon), Philip A. Stoddard ’40, Horace S. Ford, Jr. ’31, to name a few — would convene the alumni leadership every two or three years to discuss matters of management, safety and finances. They were informal meetings and generated good feelings and, I’m sure, a few helpful ideas. One very active alumnus who had attended most of these, Lindsay Russell ’50, then President of the Theta Deuteron House Corporation, Theta Delta Chi, remembers a very important all day meeting. It took place on December 7, 1963. The key players were Vice President Kenneth R. Wadleigh ’43; Frederic Watriss ’41, Associate Treasurer and Recording Secretary of the Institute; and D. Reid Weedon, Jr. ’41, then President of the MIT Alumni Association — all alumni and all fraternity men. They discussed various methods of attracting alumni support of the system, prompted by concern for the physical deterioration of the fraternity houses and the substantial difference in the cost of new dormitory construction compared to the market value of fraternities. The first tower of McCormick Hall had just been completed at a cost of approximately $19,000/student. This compared to a market value of fraternity houses of under $2,000 per student! And over 1,200 students — still about 30% of the undergraduate body — elected to live in fraternities. Watriss ’41 proposed the establishment of an "X Fund" that would be managed by the Institute and that would loan money, consistent with IRS regulations, to fraternities. The problem they faced was to establish innovative ground rules that would permit donations acceptable to the IRS to be made directly to the Institute and thus be treated as tax deductible by the IRS. This required plowing new statutory grounds in order to waive, or at least modify, "the prudent man rule" interpretations in affect at that time. First, they wished to establish the lowest possible interest rate — none, if it were possible. Second, they wished to establish the lowest annual cost by extending payments as long as possible. And third, they wished to have a maximum degree of simplicity as to the nature of the security in order to avoid problems with primary mortgages and to encourage refurbishing projects. Watriss ’41 and others had done their homework and felt that 3% interest, 40 years pay-back and a more casual loan security approach would be acceptable to the IRS. Shortly after 4:00 p.m. — the meeting had started at 9:00 a.m. — a motion was made to approve the "X Fund" and to proceed immediately with a plan of implementation. By the spring of 1964 the "X Fund" had a name — the Independent Residence Development Fund (IRDF) and a preliminary mailing was sent to all fraternity alumni. The first specific solicitation was sent out in the fall by each of the alumni house corporation presidents on their stationery (see Attachment #3). During this period, Russell ’50 recalls the informal association of alumni house presidents and trustees were given official recognition as the AIFC (Alumni Interfraternity Conference). In the intervening years since the program was launched, approximately $3,500,000 has been loaned to 32 fraternities. I should also add that, in addition to the IRDF, an additional $3,000,000 through HUD and Pool "A" has also been borrowed by the fraternities. Although the current balance of funds available for loans is low, it is an annual option for alumni to donate to the IRDF through the Alumni Fund each year — over the past four years alumni have designated an average $170,000 each year for this purpose. In addition, the interest and principal on these IRDF loans runs to about $250,000 per year. For almost eighty years about 30% of our undergraduates experienced MIT through the fraternity system. Out of this pool the Institute has derived an even higher percentage of leadership. All three alumni Presidents of the Institute were affiliated with fraternities, 12 of the 22 living past and current presidents of the Alumni Association came from the fraternity system, and 38 of the 76 alumni members of the Corporation participated in the fraternity system. Although we do not have specific data on these relative ratios among our nearly 5,000 current alumni officers, one could surmise that fraternity alumni do more than their share. Glen P. Strehle ’58 points out that he came to MIT while serving as Chairman of the AIFC from 1973-75. Although there had been a very positive Institute position prior to this, the policy had been one of allowing the fraternities to run themselves. Strehle ’58 knew that fraternities would not object to more direct support and was instrumental in adding staff support in the Dean’s office and promoting active encouragement to fund and support new fraternities — as well as encouraging and supporting more Institutional involvement with the AIFC.